Arkham Asylum has fallen. I don’t know why, exactly – – due to the fact I’m out of the Batman continuity loop, and Gerry Duggan’s wise decision to not bog his narrative down in those ultimately superfluous details – – but its collapse has left Gotham City in desperate need of a home for its mentally unstable criminal population. There are few options available to the authorities; and each idea is swiftly knocked down by the city’s citizens. After all, who wants to live next door to psychopaths like Mister Freeze or the Joker? But there is one place that fits the bill; situated outside Gotham’s city limits, its large, spacious rooms – – with a few adjustments, of course – – would make for the perfect penitentiary. That place is Wayne Manor. 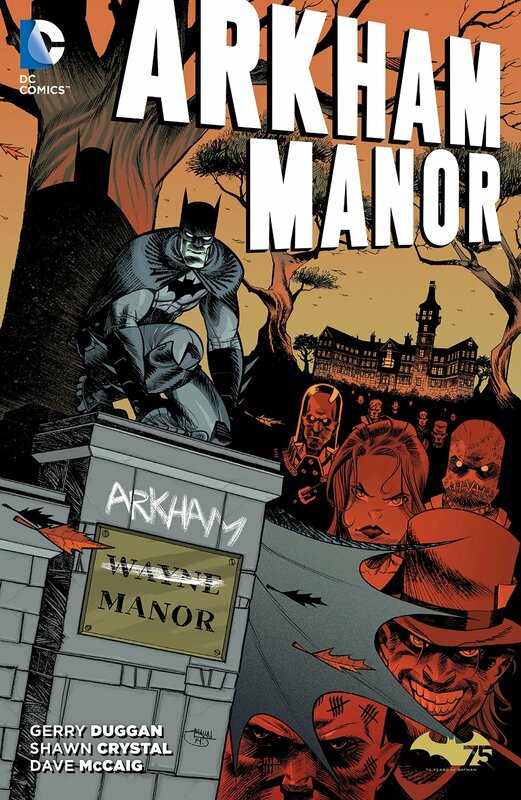 ARKHAM MANOR was a six-issue limited series published earlier this year from the creative talent of Gerry Duggan and Shawn Crystal. It couples an innovative plot with stunning artwork; two ingredients that make for a fantastic reading experience. It’s a rare example, too, of a series that earned a longer run than what we’ve got; 6 issues just aren’t enough. Not that Duggan and Crystal don’t successfully tell their story – – they do – – I just wanted more. As Wayne Manor transitions from homely manor to asylum for the insane, there are growing pains. A killer is on the loose inside the walls, targeting patients; and Arkham isn’t a place Batman can walk around freely and ask questions. So he comes up with a secret identity – – much like he has in the past, with his thug persona Matches Malone – – and plans himself in Arkham Manor as one of the patients. Along the way he has interactions with several villains – – Mister Freeze is used remarkably well as comic relief – – and investigates the murders. Shawn Crystal’s artwork is superb. Wonderfully dynamic, his style isn’t the type I’d normally associate with Batman, which is part of the reason why it works so well. It’s a breath of fresh air, and it’s nice to see a lither Batman as opposed to the bulkier version we’ve become accustomed to in Greg Capullo’s Batman run. He’s as adept with the comedic beats as he is with the horrific moments, which are graphic, yes, but never gratuitous; it’s a fine line. As for writer Gerry Duggan, I’m not familiar with his work, though I am aware of the acclaim he has received through his work on Deadpool. He keeps his story on point, his narrative taut, and finds humour in a tale other writers would struggle to.